^ Beate Dignas, Engelbert Winter, Rome and Persia in late antiquity: neighbours and rivals, (Cambridge University Press, 2007), 42. ^ Theodor Nöldeke, Geschichte d. Perser und Araber unter den Sasaniden, 264 ff. ^ Khaleghi Motlagh, Djalal (1990). “BOZORGMEHR-E BOḴTAGĀN”. Encyclopaedia Iranica. Vol. 4. http://www.iranicaonline.org/articles/bozorgmehr-e-boktagan. ^ Edwards, Iorwerth Eiddon Stephen (1970). The Cambridge Ancient History. Cambridge University Press. pp. 102. ISBN 0-521-32591-9. https://books.google.com/books?id=Qf8mrHjfZRoC&pg=PA102&lpg=PA102&dq=Philippicus+-711+general&source=web&ots=1c2UWgahNy&sig=C5CR_qG_iv07z8TUNFZ8LPwzHNY&hl=en&sa=X&oi=book_result&resnum=1&ct=result. Martindale, John Robert; Jones, Arnold Hugh Martin; Morris, J., eds (1992). The Prosopography of the Later Roman Empire, Volume III: A.D. 527–641. Cambridge: Cambridge University Press. ISBN 978-0-521-20160-5. https://books.google.com/books?id=ElkwedRWCXkC. Pourshariati, Parvaneh (2008). 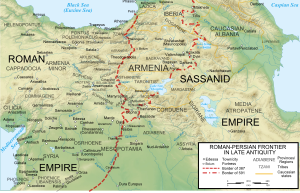 Decline and Fall of the Sasanian Empire: The Sasanian-Parthian Confederacy and the Arab Conquest of Iran. London and New York: I.B. Tauris. ISBN 978-1-84511-645-3. https://books.google.com/books?id=I-xtAAAAMAAJ. Shapur Shahbazi, A. (2004). “HORMOZD IV”. Encyclopaedia Iranica, Vol. XII, Fasc. 5. pp. 466–467. http://www.iranicaonline.org/articles/hormozd-iv. この記事にはアメリカ合衆国内で著作権が消滅した次の百科事典本文を含む: Chisholm, Hugh, ed. (1911). "Hormizd" . Encyclopædia Britannica (in English). 13 (11th ed.). Cambridge University Press. pp. 693–694.